Carl Frampton has tipped Lee Selby to defend his title against Josh Warrington on Saturday but warns the Welshman it may be for the last time. Selby puts his IBF featherweight belt on the line against Warrington in front of the challenger’s home crowd at Elland Road – live on BT Sport – with an undercard that also includes Jack Catterall and Ohara Davies. Frampton, who put on a masterclass to defeat the legendary Nonito Donaire in April, has been widely tipped to face the winner of the bout and will be in attendance to assess his prospective opponents. Frampton said: “I’m just training away. Ticking over. Plodding along. I’m looking forward to seeing Selby and Warrington fight. I’m going over there and I’ll be ringside to see it all first hand. “I don’t actually care who wins. I want to fight the champion either way. All I’m hoping is that it’s a first-round blowout so it guarantees there are no injuries, cuts or broken jaws. I want the champion to come out of it fit. “If I had to choose, I think I’m going to go for a Selby victory. Warrington is very determined and may have some success late on in the fight – depending on how Selby has done the weight because he’s quite big for it. “People think because of my stature I’m more of a brawler but I’m a good boxer. Selby is very skilled but a lot of what he does is flash and doesn’t have an effect. It’s often for show and there’s little in his punches. 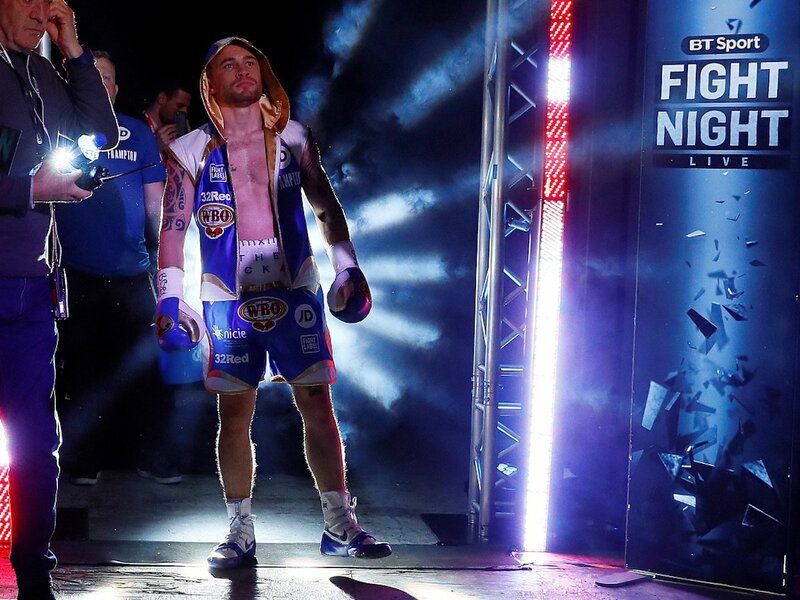 Father-trainer Sean recalls his Yorkshire terrier’s unimpeded rise to tonight’s stadium IBF title fight in Leeds and reveals why the Tyke’s are so confident they’ll emerge triumphant. “People often ask if it’s emotionally difficult to coach my own flesh and blood in this hard game but we’re from a tough council estate in Leeds where people clobber one another at school and on the streets on a daily basis. I’d much rather see Josh whacked with leather gloves in a ring, than with a cricket bat on the pavement! People seriously underestimate Josh’s toughness because of his laidback manner. Selby’s side started this Twitter war and it started to get a bit personal so Josh had a pop back. But by nature, he’s soft as owt; a real humble, relaxed kid who goes out of his way for everybody, hence his popularity. Josh doesn’t know how to be nasty and, you know what, neither does Lee Selby. They’re just two decent kids who desperately want to win a world title fight on Saturday. At the end of the day, its just 36 minutes boxing and, whichever way it goes, I hope both come home safe. I personally like Lee Selby. He’s an ordinary guy like we are and a very, very good fighter. I’m a fan of boxing at every level, not just my own son, so you have to admire Selby’s class. We’ll be mindful of his ability to control the pace, his accuracy and his movement. He’s good all round but I don’t think his recent opposition has been brilliant. He’s had an easy ride as world champion. I don’t really buy into these ‘Selby has fought in better class’ or ‘Selby hits harder’ lines. Josh has stopped six of his last 11 at title level, Lee has stopped just three of his last 11 and I believe Josh has faced more ‘live’ opposition. The Selbys have been riding off the back of that stoppage win over Stephen Smith for way too long. It was almost seven years ago and we know of reasons why Smith wasn’t himself that night. Home advantage is a bonus. In Leeds we always turn out and back our own. Josh finally gets his opportunity at his beloved Leeds United with his favourite players, past and present, willing him on from ringside, and his favourite band, Kaiser Chiefs, playing a set to rouse the crowd. For Josh, it symbolises that he’s arrived. It’s going to be a very, very special night. Several mention that Josh might get carried away with the emotion of it all but that won’t be the case. The First Direct Arena was built for acoustics so the noise outdoors won’t be any more mental than when we’ve fought there. He coped then. Josh has worked so hard that he fully deserves to enjoy his ring walk and savour the atmosphere. But as challenger, he enters first. The other mob are sure to keep us waiting in the ring as long as possible so that’ll give us time to restore a bit of control and respect. The crowd does get him emotional but, once the bell sounds, his concentration is very good. Lee’s held his belt so long now, and had such an easy ride of late, I believe that mentally he’s become lax. Complacent. He says all his challengers were ‘easy work’ when, clearly, they weren’t. (Fernando) Montiel enjoyed some massive successes against him and he was a 36 year old ex flyweight! They’re a complete contrast of styles. Obviously, I’ll not reveal our plan but Selby claims there’s no way we can outbox him. Wait and see! Josh is so determined. He simply won’t allow himself to get beat but the main reason I’m so confident is because Josh is a natural featherweight whereas Lee is a natural super-feather who trains doing 20-minute rounds in a sweat suit. While we can focus solely on strategy and improving technique in camp, Selby will have a real struggle just to make weight. Consequently, he’ll not have the reserves we’ll have. We believe that when we go up through the gears, Selby won’t be able to go with us. I genuinely think that Josh could stop him. Lee can be caught cold, early. Eric Hunter put him on his arse but Hunter’s a lazy fighter and failed to capitalise. Josh won’t have to save any fuel for the later rounds. He’s got phenomenal natural stamina. If he tags Selby, he’ll be over him like a rash. Very limited General Admission tickets for Selby v Warrington are available from just £40 per person.